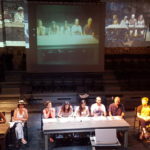 UK cast member Nadi Kemp-Sayfi reflects on the Phone Home workshop in Athens. The sun was beating down on us this September as the London team arrived in Athens for the final stage of R&D for Phone Home. Our hosts in the Sfendoni theatre in the Acropolis district were as warm and inviting as the weather, with its bright mornings and baking evenings, every moment greek-coffee flavoured and filled with heated conversation as practitioners went head to head over Retsina and post-rehearsal souvlaki. Upon our arrival at the theatre, we had each been given a bound copy of our script, and with the encouragement of our three directors, we would spend the next three days of work diligently taking it to pieces. The script, which the London team would later affectionally name the TAICS (the ‘Text As It Currently Stands’), was an incredible melange of ideas and images, collated and compiled by the dramaturgs from each country over the few months since we had all met in Munich. Last time, we had enjoyed four days in Pathos, a name label on each of our chests, and an invigorating feeling in our guts that this project had the potential to go absolutely anywhere. Six months later, the name badges were, save for a few new faces, unnecessary, but the creative anticipation was now fluttering at resonant frequency. We spent our first few sessions as a full company reading through the 100 or so pages of the script, sat around the large wooden table we had constructed in the middle of the Athenian stage space. 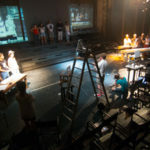 Questions were asked, conceptual choices sounded out, and tentative plans made for the technical rehearsal of some of the more ambitious tech-driven scenes. “We’ll try it!” was the directors’ chorus, and the actors just grinned at each other. “This is mad” Munich’s Melda said, turning to me with a smile as we sat together for lunch. We did some more grinning. What more could I say? There was a magic to the sense of contained mayhem. The Phone Home project seems to have a life of its own, and I don’t think any of us can claim to know what will happen next, or what to expect, or even if ‘The Gods’ (our tongue-in-cheek title for the three country’s artistic directors) are themselves sure of where they are leading us. The crux of this is something that Angelika, one of the German cast members, pinpointed perfectly during our final crew and cast meeting: Phone Home is relentlessly current. 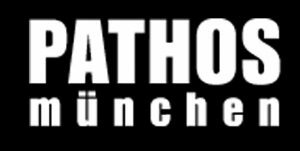 The project began its journey long before the refugee crisis swept into the forefront of the European psyche and the world’s news headlines. And yet we now find ourselves interrogating the concept of ‘home’ from three corners of a continent struggling to cope with the greatest exodus of people in a generation. Every week that passes changes the context of the theatre we are making and the stories our dramaturgs have compiled. Everything we do is relevant and rendered all the more current as each week passes, as our referendum quips and clowning interludes seem to mirror the latest polls and political interviews. As Angelika so eloquently put it, our show is necessarily dynamic and elastic, and for this to work we must be as malleable as our content. We must be fearless in letting this show take us on the ride, whatever that might be. From inevitable tech issues as Skype calls drop mid-show, to the ever changing political landscape our stories are drawn from, Phone Home is going to be a production that happens to and with us, rather than as a direct product of our creativity. 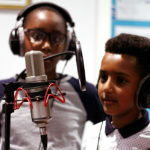 The stories tell themselves, and as the London team have increasingly found in our own rehearsal studios, our real job as practitioners is to not get in the way of the play. 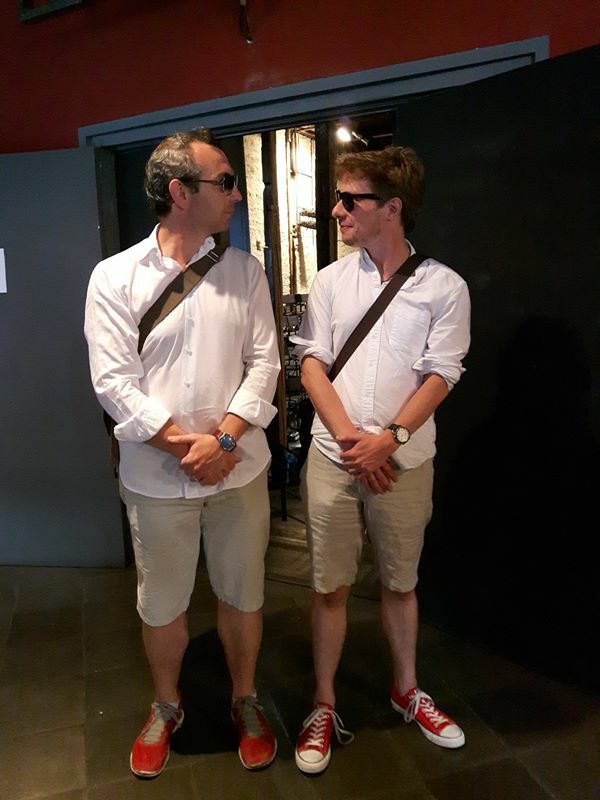 Michael Sommer (left) and Tom Mansfield demonstrate the North European directors’ dress code. 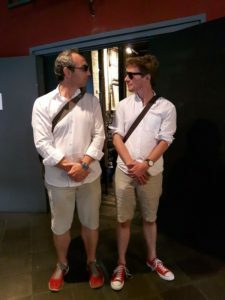 And yet despite the variables, there is a strange neatness and togetherness about the proceedings- a point proven when Tom and Michael, the directors for London and Munich, turned up to Sfendoni one morning in identical outfits. Yes, yes, they said it was an accident, but I’m beginning to think that nothing about this project is an accident. Not even our mistakes, not even our oversights, and, dare I say it, not even the moments of genius. 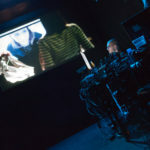 For the real ingenuity of this project is not that we all know exactly what we are doing, but that our production team have put these particular people together in one virtual room, connected by wifi, video projection, and a deep desire to do justice to the stories that have been composed. The beauty of this project is the generosity and determination of the people I have found myself working with, and the shared ambition to provoke not only our local audiences, but the audience’s of our counterparts in each country. Our rehearsals in Athens were much too short, being the last time the complete company would find itself in the same physical space. But I believe the reason for this is more emotional than it is practical. Cast and crew, we are a group of people raring to confront and overcome the challenges of performing together while thousands of miles apart, but I think the real problem is that we’ll miss each other’s company. If nothing else, Phone Home, and those moments in which a room full of professionals look around and just grin and grin, will be the reason that this project will be only the first in many pan-continental collaborations and endeavours. I believe this is the beginnings of a theatre centred on practitioners from across the continent working together to tell stories and reach new audiences. There is a gloriousness in working together, which is compelling in ways that we can’t be when apart. But for now, for Phone Home, we have a lot of work to do!